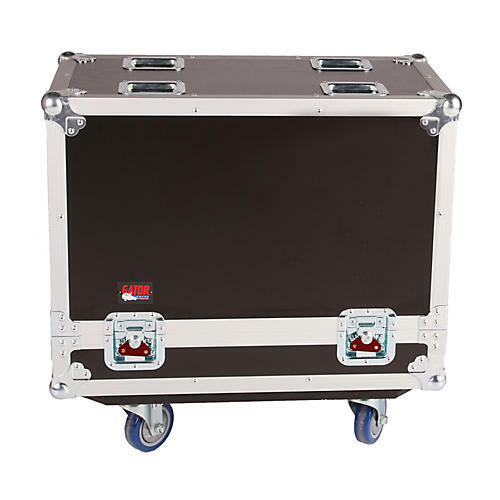 The G-TOUR SPKR-2K10 Speaker Transporter is designed to fit and protect two QSC K10 loudspeakers between gigs. It has a rugged plywood construction with PVC exterior and aluminum valance, and the PE internal padding & EVA foam divider keeps your speakers secure during transport. As an added bonus, there's a built-in storage compartment inside the divider for your accessories and cables. The G-TOUR SPKR-SK10 has red recessed twist latches and spring-loaded rubber gripped handles as well as 4 casters, 2 three-inch which lock into place so that it doesn't roll away on ramps and curbs. Interior dimensions (LxWxH): 14.5" x 15" x 24"
Exterior dimensions (LxWxH): 34" x 16" x 30"